Our ship docked at Breisach, you can see the usual gangway under water, an additional walkway added for our use. There’s nothing at all Viking River Cruises could have done. Lord knows they didn’t turn on the rain in the previous couple of months that lead to the record-breaking flooding of the Rhine and Danube (and surely other) rivers late May and earlier this month. I had been in Europe since late April and certainly noticed it was a particularly damp spring in Paris, enough so that this Seattleite was even taking pictures (and one video) of the deluge. It was that noteworthy. But it oddly never occurred to me that the May showers would have an impact on our early June cruise. But there we were on June 1, having taken a morning train from Zurich to Basel, then hopping in a cab at the train station for the ride out to the river dock where we were to board our ship. No ship. But a cruise rep was there to tell us to head to the airport where we’d meet fellow passengers for transport (by van, I guess the airport just proved a convenient place to rally everyone) to the next city along our itinerary, Breisach, Germany. 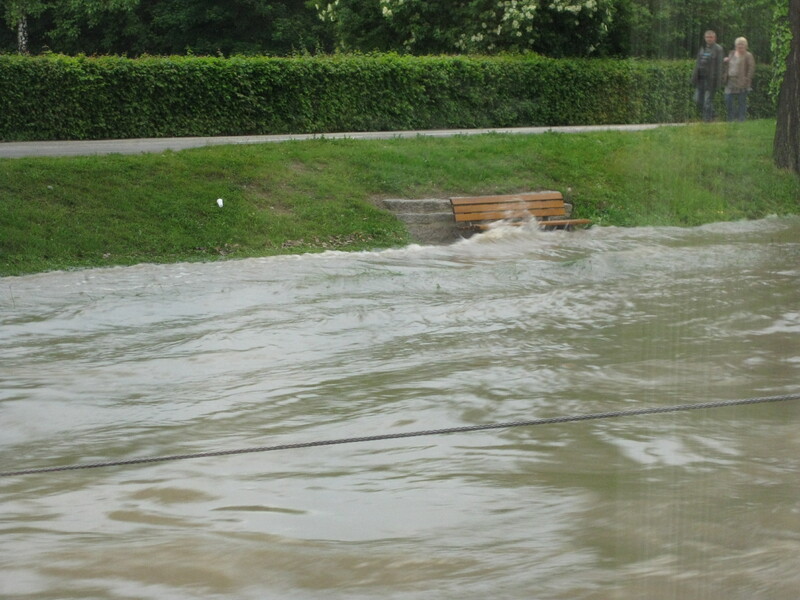 Given high waters, there was concern about a particular bridge near Basel we might not be able to clear, so they were bumping us ahead to avoid that potential hurdle. 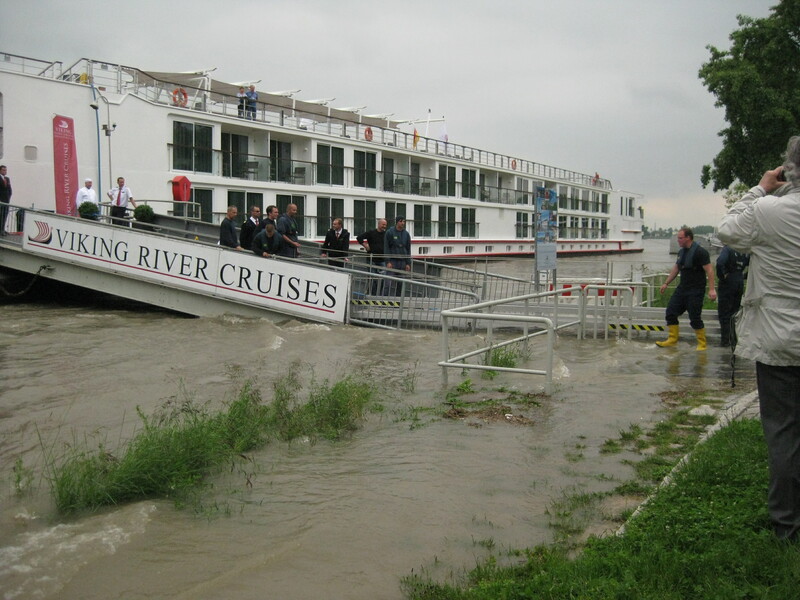 While that seemed like a minor little amendment at the start of our intended cruise, it was just the beginning of a soggy saga that resulted in our never spending a moment of the 7 days gliding along the Rhine, just docked on its banks instead. Governmental authorities essentially shut down the Rhine to (I believe) all river traffic, so there was truly nothing to be done about it. The irony is that the weather that week was actually quite nice, mostly sunny, even hot on a couple of days. But of course a quick change in the weather doesn’t impact swollen rivers, they take their time in receding to normal levels. From the ship looking to shore, that park bench gives an idea the high water levels; and even the lower water level seen earlier is above normal. So we stayed docked in Breisach for four nights on a lovely floating hotel (we were on the Forseti, a brand new ship, I heard that we were just the second batch of passengers) and day-tripping to the intended destinations. And by “day tripping” I mean bus rides. The Black Forest was right there, the usual excursion from Breisach. 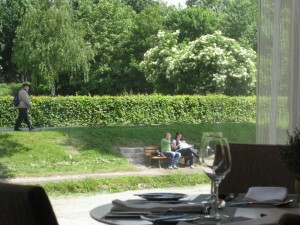 Next day, Strasbourg, not bad, a little over an hour away. Heidelberg? That was a different story, a good 2 1/2 hours each way (longer home, really awful traffic). It was stretching our collective patience a bit, having to spend more time on the bus than in the town, but by then we’re all bonding and folks were making the best of it all! 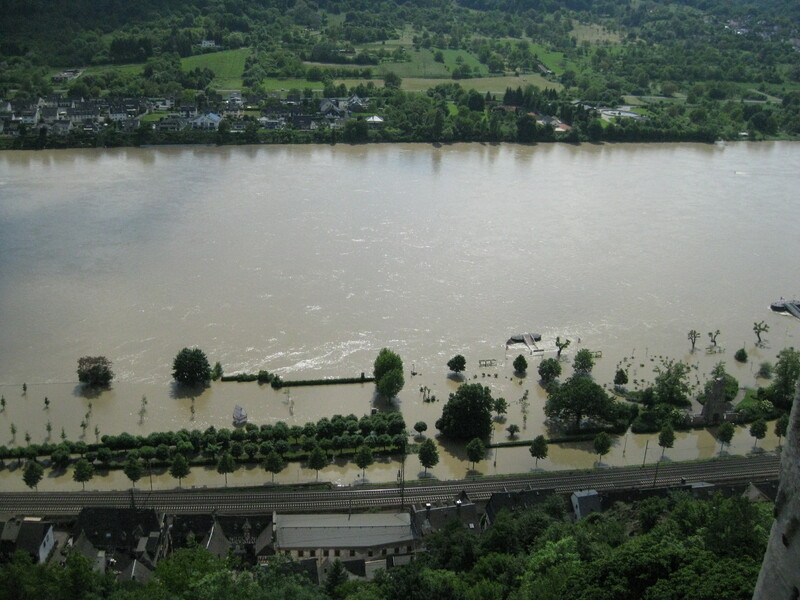 An impressive perspective rom Marksburg castle looking down on the swollen banks of the Rhine. For the last leg, we packed up and left the Forseti, transferring to another ship up in Cologne, stopping at the impressive Marksburg Castle en route. Cologne was a treat, I had no idea its Gothic cathedral was such a marvel, we enjoyed our tour and visit there. After a couple nights on that ship, it was up to Amsterdam finally, to wrap up with one final night together, then off on our separate ways. We even ran into a some of our cruise cohorts in town a couple of days later. We’ll give river cruising another shot before long. Viking managed the situation as best they could. We really love the idea in principle, the smaller ship, closer proximity to sights and attractions, docking right in town with direct access. And it was nice to get to know some great folks that week too, the smaller setting (just 150 or so compared to the 1200 on the sea cruises we’ve done), much more opportunity to become familiar in a couple of days, even leaving as friends ready to plan another excursion together. It may not have been the week-long river adventure we’d hoped for. It certainly wasn’t as relaxing, busses and traffic are no replacement for lounging on a river boat. But vacations go wrong in far more dramatic fashion, we still had some adventures, saw some lovely sights, explored parts of Europe new to us. We’ll be on board again. 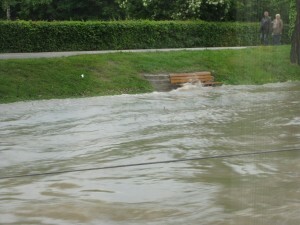 Fingers crossed for neither flood nor drought (that may be just as bad?) but a nice uneventful traipse down some lovely river. We just had a similar Viking adventure on the Rhine. It started May 1 2015 in Basel and made it as far as Kehl, Germany across from Strasbourg on the second day before the river was shut down. Our ship the Gefjon never moved after that and we were on the plan B bus tour for the remainder of the trip. Originally our Rhine itinerary included Heidelberg, Koblenz, Trier and Luxembourg followed by a bus trip to Paris. Instead we were bused to Heidelberg one day, Baden Baden the next returning to the boat each afternoon. Finally we were bused to Trier stopping in Braubach for a two hour cruise on a rented sightseeing boat. The next day we were taken to Paris. We did see a number of the sights and overall it was a pleasant trip even though we spent way too much time on the bus. The food on the ship was great and so was the service.